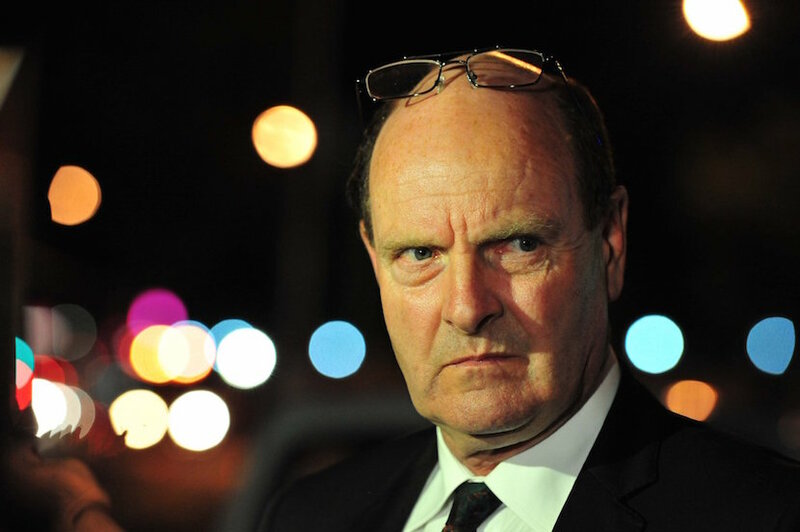 SA’s famous forensic investigations consultant Paul O’Sullivan was among around 600 South Africans who gathered on Saturday outside South Africa House on Trafalgar Square in London. They were showing solidarity with the hundreds of thousands back home who marched yesterday (April 7) demanding the resignation of the country’s deeply corrupted president Jacob Zuma. While SA’s attention was focused on the rolling mass action #ZumaMustFall campaign, around two dozen policemen arrived at O’Sullivan’s Johannesburg offices with a search warrant and spent six hours going through his computers and hard documentation. As the protestors gathered, I asked O’Sullivan what was behind it all. What emerged is another explosive instalment in SA’s State Capture saga. – Alec Hogg. Well, I’m here outside the protests…just outside South Africa House in Trafalgar Square in London and here’s Paul O’Sullivan. Jeez, Paul. It’s good to see you in London. Thanks, Alec. It’s nice to be here and it’s a lovely spring morning so I was expecting it to be very cold and wet but the sun is shining. There’s a clear, blue sky. I think the temperatures are going up and it looks like the temperatures are warming up in the crowd here as well. Quite a crowd – a few hundred people already – and it’s only due to start in about 20 minutes or so. You’ve had some drama in your life. Yesterday, South Africa was marching and O’Sullivan was raided. Yes. You know, the problem we have is that Zuma has appointed his ‘chosen ones’ to run the Police and the Judiciary and the result from that of course, is that he now controls the criminal justice system. What I’ve done over the last few years is I’ve taken steps to expose the corrupt appointments that he’s made and the best way to do that is to dig into the background of these people and prove to the country and in fact, the whole world that Zuma is appointing criminals to run the criminal justice system. The current Acting Chief of Police – Johannes Khomotso Phahlane is nothing short of/less than a criminal. There’s no doubt in mind whatsoever that he’s as corrupt and as filthy as they come. What he’s been doing is abusing his power to go after people that should actually be receiving medals for exposing the corruption in the system. You only have to look at his partner in crime – Ntlemeza (and his partner in crime – Mokotedi). They’re all criminals through and through and they’re all linked very closely to Zuma. They’ve all pledged their allegiance to Zuma. Another man who seems to have escaped a lot of publicity is Richard Mdluli. He’s been on suspension for the last six years and he’s Zuma’s undercover ‘go to’ guy. He’s still running the Police even though he’s on suspension. Talk about running the Police. With the excuse for firing Pravin Gordhan, Mbalula was made Head of the Police. What does that mean? Yes, a little bit. When he was Deputy Minister of Police, which was a few years ago now; I remember when I first started climbing into Krejcir, where the Scorpions had passed along and the Hawks had just been formed. At that stage, I was quite impressed with the Hawks because you had people like Dramat and Sibiya. Dramat was the National Head and you had Sibiya who was the local head of the Hawks in Gauteng and they were really getting the job done. I went on a couple of radio and TV shows to discuss matters pertaining to Radovan Krejcir. On occasion, I had to meet once or twice with Fikile. Now, he came across (to me) as quite a straight-talking guy. I guess it’s too early to see whether or not he is going to be a straight dealer or not. Certainly, if he’s going to stick to his Oath of Office, he will very quickly now get rid of Phahlane, Ntlemeza, and Mokotedi because those people are wholly unfit for purpose. If they are all Zuma’s appointees and he’s also a Zuma appointee, aren’t you clutching at straws? Well, his duty of care is to the people of South Africa and the Constitution. His duty of care isn’t to the President. If he’s going to exercise a duty of care to the President, it means he’s cast in the same mould as the rest of them. In other words, he’s also corrupt. You’ve got to look at those three names. They’re very interesting. Phahlane: I think we’ve exposed him already. These people had to raid my office yesterday to get stuff, which Phahlane could have given them. You say they raided your office. What happened? About 20 cops arrived at my office yesterday. Yes, in Sandton. They were very rude to my staff. They were calling my staff criminals when in fact, they are the criminals and we’ve already opened dockets against them for my unlawful arrest on the 14th of February. Jane (my legal advisor) was illegally arrested on the 10th of January on a Friday afternoon and kept behind bars for several days. This is the sort of thing the Apartheid state were doing and in fact, the cops involved in this were police officials during the Apartheid era so they’re just doing what they were trained to do by the Apartheid government. What was in the warrant? They were stupid because the warrant was incapable of being used because the warrant stated that they wanted things like computers and memory sticks, which was all under my control. They also wanted my cellphone, which is with me right now. I think what will happen is when I go back, I will leave my laptop and cellphone here and I’ll just buy a new cellphone when I get back there. I’m not going to allow these dirty cops to have their wicked way with me. Are you likely to get arrested when you arrive back? I don’t care if they arrest me anymore. They have arrested you before. Paul, where does it all end up? We can go into lots of details. You’ve exposed all of this nonsense. Where does it now end? Hundreds of thousands of South Africans took to the streets yesterday [Friday, April 7]. Rolling mass action has begun. Do you think that is finally going to let somebody, somewhere register? Yes. I think it will probably end in 2019 when the elections take place. Then I think the ANC will be out of power. By 2019, they will have had 25 years – a quarter of a century – and in that quarter of a century, they would not have improved the lives of the South Africans that they promised they would do. They would have completely broken their promise. The top one percent of the ANC would have enriched themselves beyond belief and they won’t give a damn about the people of the country. Many of them will march off into the sunset with their wealth and hopefully, we can pop a few of them into prison. Certainly, people like Mahlobo who is (in my opinion) …any sitting Minister that visits massage parlours…the pictures of him with the Ling-Ling twins is very sensational. No self-respecting man, let alone a Minister, would spend his time in Chinese massage parlours where the owners are involved in rhino poaching and stuff like that. If we look at these three cops that I’ve named: Phahlane, Ntlemeza, and Mokotedi. Phahlane has built himself an R8m mansion. On paper, it cost him R200 000.00 to build so he has a lot of explaining to do there. He thinks he can avoid the explaining by attacking me. It’s not going to happen. We’re filing papers in court next week. I’ll send you a copy of them as soon as we’ve filed them. The world will see what that man has been up to. Ntlemeza: he had a judgment against him last year by SARS. He owes SARS R131 000.00 for undeclared income. Now, if the Head of the Hawks has undeclared income and a tax bill for R131 000.00 as well as a judgment against him for that, the country needs some explanations. His spokesman – Mulaudzi – who he brought with him from Limpopo: the only explanation he could give is that the private affairs of Ntlemeza have nothing to do with the country. Well, it has everything to do with the country. I sent people to court to get the court file and we found the file had been stolen. Now, there’s only one person who can benefit from that SARS court file being stolen, and that’s Ntlemeza himself. Then we look at Mokotedi. He was illegally appointed as Head of Hawks in Gauteng and at the time he was appointed, he had R1.1m in civil judgments against him, which are still against him. He hasn’t paid off those debts. Then he announces to the world on a radio station one day, that he’s done a deal with a mining company and they’re going to pay the debts for him. What kind of person is that to have as Head of Hawks in Gauteng? So, the struggle continues from your perspective. How’s it going with AfriForum? You’ve linked up with them now. You’re going to be bringing private prosecutions. Do you have any in the making? As you can hear, the protestors are a bit away from us, but they’re making a lot of noise. Let’s just carry on with AfriForum. Yes, I think they’re going to make a mark. People phone me on a daily basis, asking me how they can help. I tell them, “Okay. You can sign up for AfriForum. You can become a member of AfriForum.” The other thing we’re doing next week Alec, which is going to be quite exciting, is that we’re launching a new website. It’s going to be called Forensics for Justice. It’s going to be a dot.com website. It’s going to be located in Maryland in the United States in one of these Cloud bunkers with top security on it, so that nobody could get there. It will have a firewall so they can’t shut us down and it’s going to be like a South African WikiLeaks on the Criminal Justice System. We are going to expose all of these dirty cops, we’re going to post it on that website, and let them do what they want about it. Are you going back to South Africa? Oh, yes. Absolutely. It’s my home. Nobody’s going to put me out of my home. I would rather die for that country than let them chase me away. I am not going into exile. I believe that justice will prevail and that these criminals will go to prison. I’m due back in South Africa (I think) on the 15th of May. I’ve got a few bits of work to do here in Europe. Tomorrow, I’m flying to Prague in the Czech Republic, where I’m working for the whole week on some cases involving Radovan Krejcir. After that, I’m in Paris for a week. Then I’m in Moscow for a week and then I have to go to Washington. Then I’m back to London and then back to South Africa. I’ve got a lot of work to do but it’s necessary work. Just watch this space. We’re going to make sure these criminals in the criminal justice system are exposed.